so easy so delicious, you just have to find the right plantain and then you’re minutes away from this tastiness. 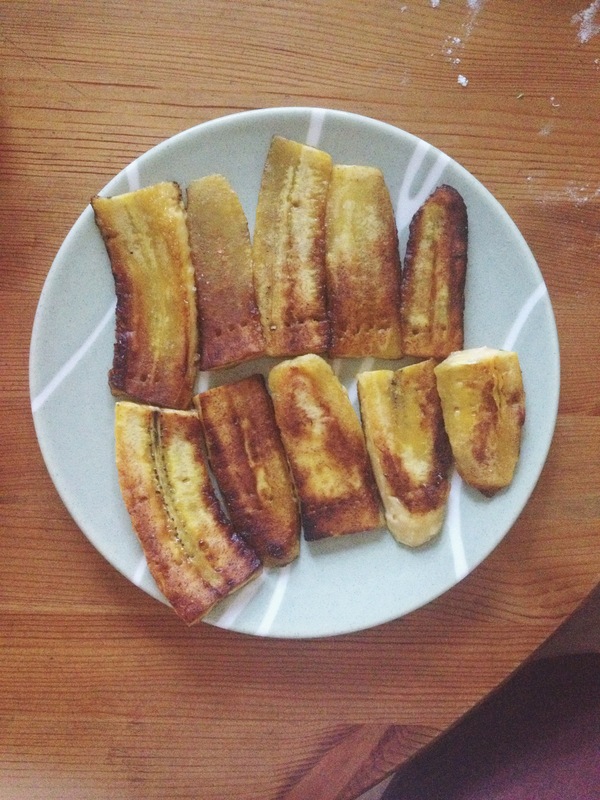 If you’ve never had fried plantains it’s hard to describe the flavour: salty, caramel-y, subtly banana tasting but starchy almost like a potato. it’s perfect. Peel the plantain. Peeling like a banana probably won’t work so make a slit down the length of the peel and cut the ends off. pry the skin off, taking care not to break the plantain. slice it in two (so you have two stubby pieces) and then cut each half into 3 or 4 slices. Heat oil in a pan (i use a cast iron), add the plantains and cook in a single layer. Salt liberally* and flip once golden. Eat em up! You don’t need a dip or anything, they are perfect as is. * i’m not into really salty things but you want a good hit of salt on these. you can always salt them again later to taste once they’re cooked.